Many years ago, at Sidmouth International Folk Festival, a group of English fiddlers formed an impromptu band with cello and bass included. Dubbed The English String Band, our job was to play an overture or two at the Arena, an outdoor concert venue sited at The Knowle, a public park above the town. Although the band was short lived, the idea stuck around for a few decades until fiddler Taz Tarry decided it was too good an idea not to exploit once more. Enter The English String Band Mk.2 with a few of the original members, but more importantly a pool of excellent musicians of today, to call on whenever an opportunity to play presented itself. Having a musicians’ pool simplifies the task of sorting availability as all of the musicians also play in other bands and aren’t always free to play. 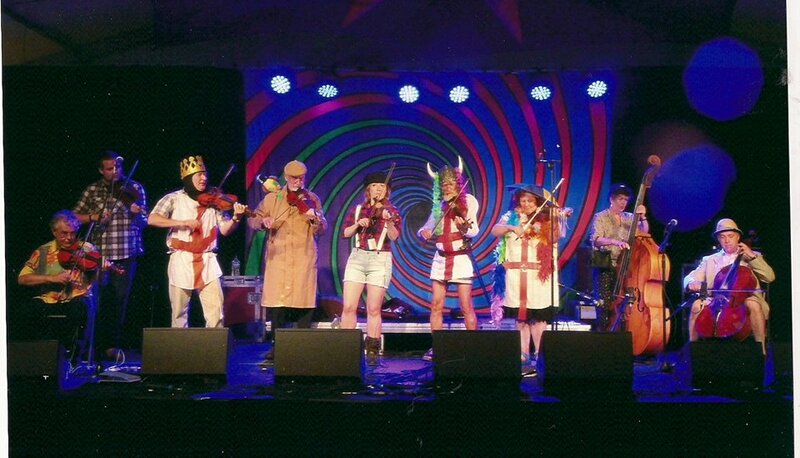 The English String Band take a Monty Python themed night seriously! The English String Band web site.